Georgetown’s latest opening was all about sweatpants with a side of self-sufficiency. 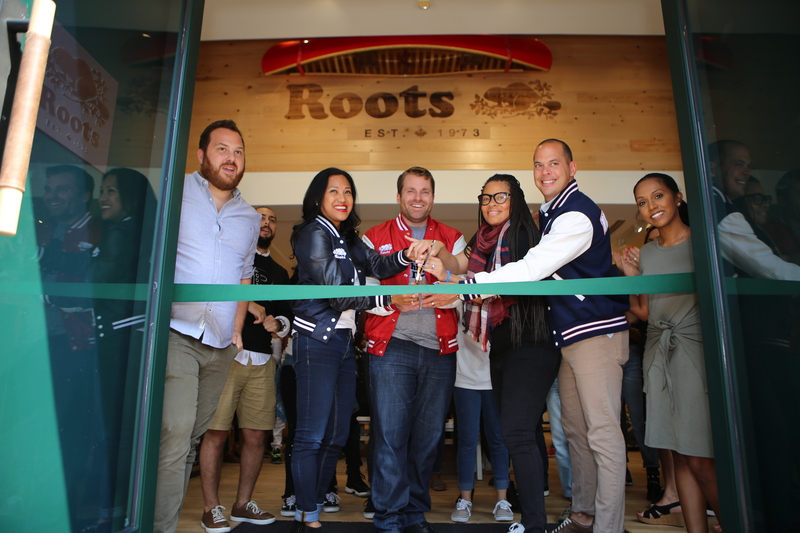 Canadian outdoor lifestyle brand Roots opened its first DC location on M Street this month with a boon for athleisure lovers and local charity. A line of mostly college-aged customers queued up be the first to shop the retailer’s popular Salt and Pepper Sweats, leather bags, and new exclusively DC apparel, while also hoping to snag some free swag. 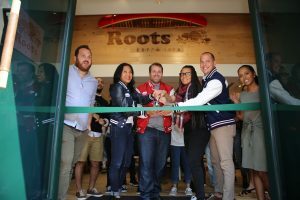 The first fifty in store received a coveted Roots Leather pouch with a 25% off voucher, while the day’s first 250 purchases went home with a Roots beach towel. All shoppers at the opening enjoyed DJ Curley Sue’s upbeat tunes and an association with retail philanthropy. 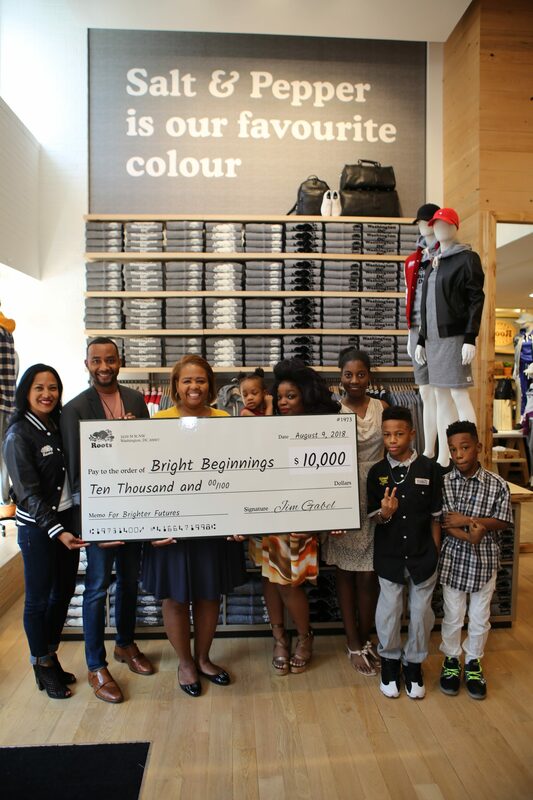 Prior to a quick ribbon cutting to open this, Roots’ 4th store in the United States, company Vice President of Retail Operations Almira Cuizon and Georgetown Store Manager Freda Fanning presented a $10,000 check to Bright Beginnings, an early childhood and family learning non-profit with a mission to assist DC families striving to lift themselves out of tough circumstances. Executive Director Marla Dean and the Barnetts, a Bright Beginnings family potentially impacted by the windfall, were on site to accept the donation. 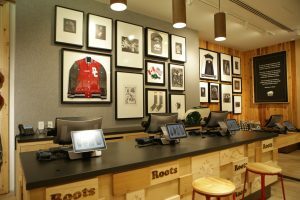 The Georgetown store is designated a “Roots Cabin,” promoted as an enhanced retail experience evoking the comforts of a modern cabin. 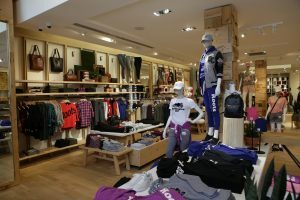 A more traditional Roots store will open in Pentagon City Mall later this Fall, securing the brand’s commitment in the region. At both locations, customers can purchase exclusive DC-centric t-shirts, sweatpants, and sweatshirts that are only available in store. 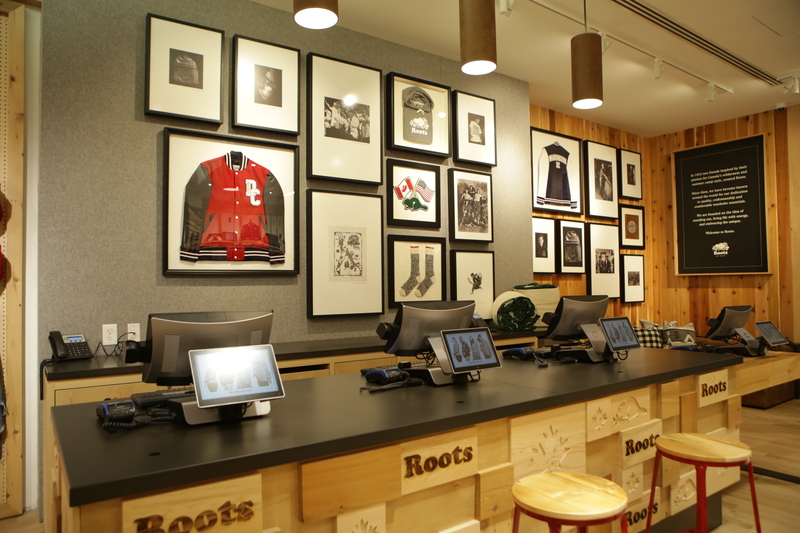 At the Georgetown store specifically, Roots enthusiasts can also visit a leather customization workshop where they can add exclusive DC patches to their Roots Awards Jackets. Georgetown’s Roots is located at 3259 M Street NW, next to Chipotle.